Allison Lake: From Princeton travel north on Hwy #5A. Allison is found on the west side of Hwy #5A. Allison was stocked with 10,000 Pennask stock Rainbows in 1994. It provides a good summer and winter Rainbow fishery for trout up to 3-1/2 lbs. Arlington lake #2: From the city of Kelowna, travel southeast on Hwy #33. Turn west (right) off Hwy #33 at the Arlington Lakes turn-off. Follow this road a short distance to the 3 lakes. Arlington is an excellent family lake providing good quantities of smaller sized Rainbow trout. Arthur Lake: Arthur Lake can be reached by travelling north on Hwy #97 from the city of Vernon. Arthur provides a Rainbow fishery for trout up to 2 lbs. Beaver Lake (Swalwell Lake): From the city of Kelowna travel north on Hwy #97 to Winfield. Turn east off Hwy #97 onto Beaver Lake Road and follow it to Swalwell (Beaver) Lake. Swalwell, also known as Beaver Lake, provides a high catch rate for the fishermen. This popular lake has also been known to serve up trout in the 5 lb range. 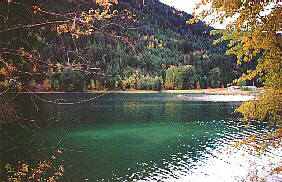 Bolean Lake: Bolean Lake can be reached by travelling north on Hwy #97 from the city of Vernon. Bolean provides a good Rainbow fishery for trout up to 2-1/2 lbs. Bouleau Lake: Bouleau can be found by travelling along a secondary road approximately 24 km (15 mi) south from the Hwy #97 turnoff. Bouleau Lake is considered an excellent family lake providing very good numbers of smaller Rainbows in the 1/2-1 lb range. Brenda Lake: Brenda is located about 30 km (19 mi) northwest of the town of Peachland. Stocked yearly with 2000 Pennask Rainbow, Brenda provides a good family fishery for trout in the 2 lb range. Browne Lake: Browne is approximately 46 km (29 mi) southeast of Kelowna. Browne is a quality fly fishing only lake which provides a fine Rainbow fishery for trout up to 2+ lbs with some occasionally reaching up to 7 lbs. Buck Lake: From the city of Kelowna travel east on Hwy #33 to the community of Beaverdell. Buck is located approximately 20 km (12 mi) northeast of Beaverdell on a rough gravel road that exits off Hwy #33. Buck Lake is considered a quality lake for Rainbows up to 2+ lbs. Chain Lake: Located approximately 40 km (25 mi) northeast of the town of Princeton. Chain is a very popular lake which provides a great Rainbow fishery for trout in the 1 to 2 lb range. Christina Lake: This lake is located just off of Highway 3 22 km (13.6 mi) east of Grand Forks. A campground with all facilities and boat launch are provided. Rainbow trout and kokanee are readily caught while trolling. Conkle Lake: From the city of Kelowna travel east on Hwy #33. Stay on Hwy #33 following it south past the community of Beaverdell. 5 km (3 mi) before reaching the community of Westbridge turn west (right) off Hwy #33 onto a gravel road which will take you 21 km (13 mi) to Conkle Lake Provincial Park. Conkle is maintained as a high use lake and is stocked annually with 8,000 Rainbow trout. Reports of trout going as high as 4-1/2 lbs. Copperkettle Lake: Copperkettle is found approximately 64 km (40 mi) from Westbridge. Copperkettle is a quality fly fishing only lake that provides fishermen with Rainbows up to 2+ lbs. Cup Lake: Cup is found northeast of Beaverdell on a gravel road which exits east off Hwy #33. Travel up Beaverdell Creek and turn right onto a branch road follow this road to Cup Lake. This small, Rainbow stocked lake provides a good fishery for trout up to 2 lbs. Dee Lake: From the city of Kelowna travel north on Hwy #97 to Winfield. Turn east off Hwy #97 onto the Beaver Lake Road. Follow this road past Swalwell (Beaver) Lake, and continue a short distance to the Dee Lake chain of lakes. Dee Lake chain supports good numbers of Rainbow, some of which will occasionally reach 5 lbs. Eneas Lake: Located west of the town of Peachland. Both Big Eneas and Little Eneas contain Rainbow trout to 2 lbs and remain popular lakes throughout the fishing season. Limited access. Echo Lake: Located approximately 50 km (31 mi) east of Vernon. Follow Highway 6 to Lumby, and turn right onto Creighton Valley Road. Stay on Creighton Valley Rd. for 22km (14mi) to Echo Lake. Echo lake is located with in Echo Lake Provincial Park. Flyfish Lake (West): From the city of Kelowna travel north on Hwy #97 to Winfield. Turn east off Hwy #97 onto the Beaver Lake Road. Follow this road past Swalwell Lake and the Dee Lake chain. Turn right just before Doreen Lake and travel for about .8 km (.5 mi). This fly only lake is known for its good Caddisfly hatches and Rainbows up to 4 lbs. Gardom Lake: Pass through Enderby and turn left on Hwy #97B. Gardom is accessed by turning left off Hwy #97B onto a short secondary road. This popular lake is heavily stocked with both Rainbows and Eastern Brook trout. Grizzly Swamp Lake: From the city of Kelowna travel north on Hwy #97 to Winfield. Turn east onto the Beaver Lake Road. Follow this road past the Dee Lake chain and Doreen Lake. Travel onto Haddo Lake. Grizzly Swamp is located just minutes due south of Haddo. Rainbow Trout are the Game Fish at Grizzly Swamp. Haddo Lake: From the city of Kelowna travel north on Hwy #97 to Winfield. Turn east off Hwy #97 onto the Beaver Lake Road. Follow this road to Doreen Lake. 3 km (2 mi) past Doreen Lake turn south (right) and follow this road to Haddo. Haddo is an excellent family lake with good quanities of Rainbows in the 1-2 lb range. Harmon Lake: From Merritt, head south on Hwy #5A. Drive for 17.5 km (10.9 mi) and then turn right onto the Kane Valley Road. Drive 9 km (5.6 mi) and turn left. From this point you will find many accesses to the lake. Harmon is a very popular family lake which provides a Rainbow trout fishery that produces fish up to 2 lbs. throughout the season. Hatheume Lake: Hatheume can be reached by travelling west on Hwy #97C from the town of Peachland. Rainbows aat Hatheume are now being caught in the 2+ lb. range. Headwater Lakes (1): Located approximately 29 km (18 mi) northwest of the town of Peachland. Headwater 1 is the largest lake in the chain and supports a fine Eastern Brook trout fishery, often reaching 3 lbs or better. Hidden Lake: Turn east at Enderby on the road leading to Mabel Lake. Travel for about 9 km (5.6 mi) and then turn south on a secondary road which will take you to a fork in the road. Take the left fork and continue on to Hidden Lake. A quality lake which supports a good Rainbow fishery for medium to large sized trout. Rainbows up to 7 lbs have been caught at Hidden. Holstein Lake: From Shuswap Falls travel north for about 10 km (6 mi) on the road to Mabel Lake. Turn east on a gravel road to Holstein. Rehabilitated in September 1985 and later stocked with Rainbows, fishing is considered a hit and miss proposition at Holstein. Hoodoo Lake: From Beaverdell. Turn east (left) off Hwy #33 onto a gravel road and follow it to Taurus Lake. Hoodoo is located just north of Taurus Lake. Trolling, spinning and fly fishing produce good results in this small Rainbow stocked lake. Hydraulic Lake: Hydraulic is approximately 35 km (22 mi) southeast of Kelowna. This large reservoir lake provides a good Rainbow fishery with trout that sometimes reach up into the 5 lb range. Idabel Lake: Idabel is approximately 38 km (23.5 mi) southeast of Kelowna. Idabel provides a good Rainbow and Brook trout fishery with trout reaching up to 2+ lbs. Island Lake: From the city of Kelowna travel north on Hwy #97 to Winfield. Turn east off Hwy #97 onto the Beaver Lake Road. Follow this road pass Swalwell (Beaver) Lake and continue onto the Dee Lake chain of lakes. Island provides a good Rainbow fishery for trout up to 2-1/2 lbs. Jackpine Lake: To reach Jackpine from Westbank take the road to Last Mountain. From the city of Kelowna, Jackpine can be accessed by taking the Bear main logging road up to Lambly Creek. Good Rainbow fishery for trout up to the 2-3 lb range. Jewel Lake: The lake is approximately 23 km (14.3 mi) from Greenwood via 13 km (8 mi) of paved road and 10 km (6 mi) of gravel road. The lake provides good winter fishery for Brook trout and there is a good balance between size and catch success. Jimmy Lake: Travel to the community of Westwold. Turn south (right) on the road following Ingram Creek. Travel this road to Jimmy Lake. Rainbows at Jimmy Lake will reach 6 lbs or better. Kentucky Lake: Kentucky is located approximately 60 km (37 mi.) north of the town of Princeton. Kentucky is considered to be somewhat slow, however it quite often produces large trout in the 4-5 lb range. Kidney Lake: From the city of Vernon travel north on Hwy #97A to Enderby. Turn east on the Mabel Lake Road. Turn north, just before reaching the small community of King Fisher on Mabel Lake, onto a gravel road that follows Dan Forth Creek. Follow this road to Kidney. Kidney supports an excellent Rainbow fishery for trout up to 5 lbs. Lambly Lake: Located approximately 36 km (22 mi) northwest of the town of Westbank (just south of the city of Kelowna). Stocked with Rainbows, Lambly is considered a good family fishery for small Rainbows. Lassie Lake: From the city of Kelowna, travel east on Hwy #33 to the community of Beaverdell. Lassie can be found approximately 34 km (21 mi) northeast of Beaverdell via a gravel road which exits east off Hwy #33 Lassie is just a few kilometers northwest of Cup Lake. This heavily Rainbow stocked lake provides a good fishery for trout up to 2+ lbs. Loon Lake: From the city of Kelowna travel north on Hwy #97 to Winfield. Turn east on the Beaver Lake Road and follow it past Swalwell (Beaver), Dee Lake chain and Doreen Lake. Access to Loon is found just east of Doreen Lake on your right (south) side. In the past Loon has produced Rainbows up to 4 lbs. Mabel Lake: From Enderby turn east (right) and follow the road about 37 km (23 mi) to King Fisher on Mabel Lake. Mabel is a large lake that provides a very good fishery for Rainbow, Dolly Varden, Lake trout, Kokanee and Whitefish. Fish tend to be very large with Rainbows reaching up to 8 lbs or better, and Lake trout that have been caught up to 18 lbs, Dollies will reach up to 12 lbs, while Kokanee average 1 to 2 lbs. Mara Lake: Located north of the city of Vernon. From Vernon travel north on Hwy #97A to the community of Enderby. Mara is found on the left (west) side of Hwy #97A, approximately 22 km (14 mi) north of Enderby. Mara, like other large lakes such as Mabel and Sugar, offers a good fishery for Rainbow, Dolly Varden, Kokanee, and Lake trout. Nevertouch Lake: Nevertouch is approximately 75 km (47 mi) from Westbridge. Nevertouch provides a very good Rainbow fishery for trout up to 2 lbs. Okanagan Lake: This is the largest lake in the Okanagan Valley. Highway 97 travels along the shoreline from Penticton to Kelowna with lovely communities between these two cities. Okanagan Lake is world famous as the home of Ogopogo, but offers good fishing, excellent swimming, boating, water skiing and other water fun activities. There are many resorts, provincial parks and campsites up and down both sides of the lake. Osoyoos Lake: Lake Osoyoos is 43.5 kilometres long with sandy beaches. On the edge of the lake, the community of Osoyoos is located in the south Okanagan at the junction of Highways 97 and 3. A variety of fish are available including Large Mouth Bass, Trout, Kokanee, Perch and White Fish. There are three boat launches and several marinas where you can rent boats, skidoos, or paddle boats. Other recreational opportunities available include canoeing, swimming, boating, hiking, and waterskiing. Oyama Lake: From the city of Kelowna travel north on Hwy #97 to the town of Oyama. Travel east on a rough gravel road for 15 km (9 mi) to Oyama Lake.Oyama is a productive lake with lots of feed supporting a quality Rainbow fishery for trout up to 8 lbs. Paradise Lake: The lake can be accessed from the town of Peachland by following Hwy #97C east to the Elkhart exit and turning north to the lake. Paradise Lake supports a very good small Rainbow fishery with trout averaging in the 1/2 lb range. Ocassionally 4-5 lb trout will end up at the end of your line. Pennask Lake: Pennask can be reched by travelling west on Hwy #97C from the town of Peachland. Fishing on Pennask is consistent throughout the season for trout to 1-1/2 lbs. Pillar Lake: From Falkland, turn north (left) and follow this good 2wd road to Joyce and Pillar lakes, found on your left side. Pillar can also be found by travelling north on Hw. #97 from the city of Vernon. Pillar provides a good Rainbow fishery for trout up to 2+ lbs. Pinaus Lake: From the city of Kamloops, travel 27 km. (17 mi.) on Hwy. #1 (Trans Canada Hwy.). Turn south (right) onto Hwy. #97 at the Monte Creek junction. Travel till you reach Westwold. When leaving Westwold, you only have to travel a very short distance before coming to the Pinaus Lake Resort sign on the right side of Hwy 97. (There are two roads off Hwy 97 that will take you to Pinaus Lake please take the first one when coming from Westwold, as the second road is not maintained.) Follow signs along Ingrim road to Pinaus Lake Resort. Pinaus Lake supports a good Rainbow fishery for trout up to 5 lbs. Postill Lake is located about 45 minutes north east of the city of Kelowna. The is located between Kelowna and Winfield on Hwy 97. Postill Lake is stocked with rainbow trout and offers good catches fly fishing for Rainbow and Brook trout from 6 to 18 inches. The immediate area is home to six excellent trout fly fishing lakes: Postill Lake, Twin Lakes, Meadow Lake, South Lake, Roddy and Heron. Postill Lake Lodge Fishing Resort offers lakefront cabins equipped with housekeeping facilities, plus lakefront or upper campsites, motor and boat rentals. Silver Lake: Located approximately 20 km (12 mi) northwest of the town of Peachland by taking the road to Brenda Mines up Peachland Creek. Silver is stocked, and is a good producer of small rainbows up to 1 lb. Sugar Lake: Turn north at Cherryville on the road to Brenda Falls, and travel for about 17 km (10.5 mi) to the south end of Sugar Lake. Stocked yearly with 10,000 Gerrard Rainbows, Sugar is reporting good catches of Rainbows up to 5 lbs Dolly Varden have been caught up to 12 lbs. Skaha Lake: Located in the South Okanagan has easy access from the city of Penticton and the town of Okanagan Falls. Skaha is best known as a tourist destination and a family vacation lake because of its lovely sandy beaches and windsurfing opportunities. Tahla Lake: Located approximately 70 km (43 mi) northwest of the town of Princeton. Tahla is stocked with Rainbows. This is a very productive fishery, producing trout in the 2+ lb range. Taurus (Bull) Lake: From the city of Kelowna, travel east on Hwy #33. Stay on Hwy #33, following it past the community of Beaverdell. Turn east (left) off Hwy #33 onto a rough gravel road, and follow it to Taurus Lake. Stocked yearly with Rainbows, Taurus is considered a good producer of 2+ lb trout. Thalia Lake: Thalia can be found by travelling north on Hwy #5A from the town of Princeton. Thalia provides a very good Rainbow fishery for trout that average in the 1-3 lb range. However this lake is also well known for its large fish as well. Rainbows up to 22 lbs have been caught. Thone Lake: Thone is located northeast of Westbridge on a secondary gravel road which leads right (east), off the main road to Christian Valley. Stocked yearly with Rainbows, Thone produces good quantities of trout in the 1+ lb range. Whitehead Lake: Whitehead is located west of the town of Peachland. Managed as a quality lake, Whitehead is stocked annually with 10,000 Rainbows. This lake supports a good Rainbow fishery capable of producing fish up to 6 lbs. Wilgress Lake (Loon Lake): This small lake is located 22.4 km (14.3 mi) west from Grand Forks on Highway 3. provides the visitor with camping facilities, boat launch , picnic site and modern restroom facilities. Ice fishing is good for rainbow and brook trout. Xenia Lake: The lake is 30 km (19 mi) north of Grand Forks on gravel road then 6 km (3.7 mi) by 4X4. Rainbow trout averaging 1 kg (2.2 lb) are readily caught using trolling or fly fishing methods.